Firstly, an extra special exciting package arrived yesterday. No Ms Lottie, not the one from Hancocks, but a special package from a special online friend. Now, if you pay any attention to my blogroll, you will have read about Suz at Patchwork n Play who lives in Australia. She very kindly offered to send me her Echo scraps once she'd finished piecing her lovely Echo quilt. What! I know! All I asked was what she intended to do with her scraps (mostly because Echo fabric has been turning up in so many beautiful projects across blogland that she must have had another project up her sleeve) and - next thing, she's offering to send them to me! Now, I've just borrowed this photo from Cille who blogs at Live Love Quilt (who also appears in my blogroll and she's from Denmark) who made this quilt from a pattern on the Moda Bake Shop website. I think it's fab, and will really suit all my little bits of Echo. Isn't it going to be a real United Nations sort of thing? Have you ever come across Sweetwater's Hometown fabric range? It's not that new... and has become a bit difficult to find the entire range. Anyway, I finally found someone semi-local (well, from Australia actually, but that's closer than the US) who had a Layer cake in stock. So now I'm also thinking, something round and maybe appliqued on (although these particular blocks are totally pieced, eek, inset circles). In case you're wondering, this quilt is from this book, which I really like! And my flower box outside my studio window is really coming along... won't be long and my bulbs will be flowering. 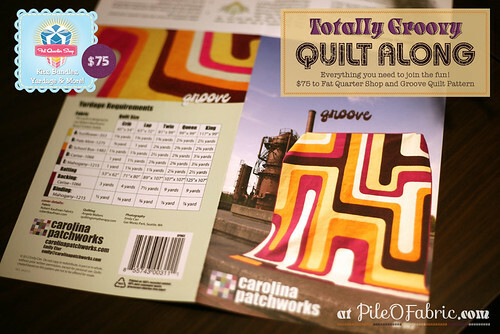 In other news, I signed up for a quiltalong... mental I know... doing this groovey quilt... no really... The Groove Quilt. Pattern purchased, trying to work out if you can do it in some sort of scrappy way as I have these orange fat quarters which sort of read as solids??? But to choose the other colours... deep thoughts for another day. And that's pretty much me for today... well, I did see two monarch butterflies in an intimate moment... have you ever seen butterflies doin' it before? One didn't appear to be enjoying it, could have been thinking of the queen, although it appeared to be dead... may have to google life cycles of such things... have you been up to anything interesting? The fabric stash cupboard - by some miracle of photography it seems much smaller than real life. All these little piles have some meaning... not always obvious at first sight. The plastic container on the seventh shelf down contains my favourite... fat quarters. Almost a shops worth... almost! These containers originally held the fat quarters, but they were never big enough to fit... and I had to open all of them to find anything... which of course, I never did. Much better holding scraps. My mum bought me this cool little thread storage unit. And this container has got quilt tops awaiting basting and quilting... it's full to the top. This set of shelves has WIP's in the boxes through the top section, and a weird assortment of crafts from my previous life (ie before quilting took over) in the containers along the bottom. Check out my huge big cutting mat. Thank you Spotlight for having a half price sale! FMQ tip number two: if you don't like gloves... or don't own any - try using some of the grippy shelf liners cut to the right size for your hands. Quilt the area you are working on, then lift and place into the next area. I find it great for reducing strain on my thumb area. And look what I've finished quilting below!! You know I only went into the sleepout to get some mince out of the freezer! And my next budget tip: can't afford those expensive mats to stop your foot slipping? Try a piece of yoga mat cut to size. I find it tends to slip a bit on carpet - but works like magic on the chair mat.